Mian Situ’s epic paintings of the Chinese immigrant experience in the opening of the American West have made him one of the most important painters of our time. These works are often counter-balanced in his shows by intimate portraits of the people and places of China itself. 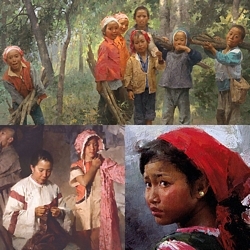 Contemporary rather than historical, a painting such as Firewood Gang shares the joy and exuberant nature of life in rural China.